With the holidays upon us, it's nice to have someone to lean on for moral support... and someone to keep us looking beautiful. 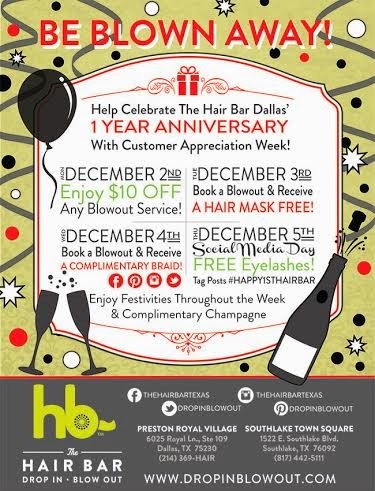 The Hair Bar Dallas at Preston and Royal is celebrating its first anniversary this week with events and specials. I'd be there in a heartbeat if I didn't have finals for the next few weeks. Blowouts, beauty, and bubbly - does it get better than that?